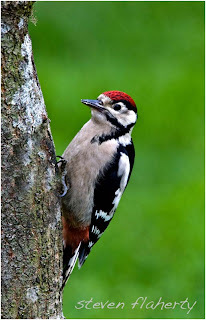 Hi all sorry for the delay in putting any new images on lately have been very busy taking pictures of young Greater Spotted Woodpeckers. 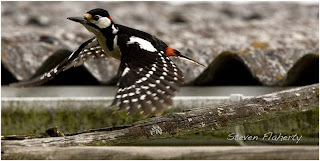 This time of year is great for seeing young fledgelings and in the month of June and July is great for seeing the young of Greater Spotted Woodpeckers. I missed them last year as I was having a interview for my degree and they never really came back last year. 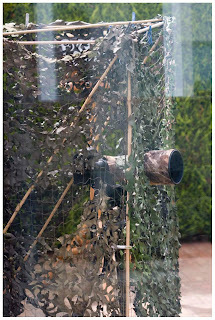 As you can see it a is a simple Hide made up of Bamboo canes with a camouflage net put over the top. In the picture is my camera setup on a wimberley head. You can see that the lens has been camouflaged by using a cover available from wildlife watching supplies. This cover helps break the outline of the lens up helping it less likely to spook wary wildlife. At the back of the hide is a brown screen, this was put in place as it helped break up the outline of the person that is using the hide. When I was using this hide I also wore clothing that would help break up my outline. Such Items as a DPM Jacket. 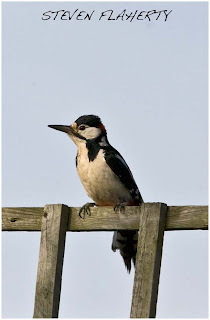 To get the pictures of the woodpeckers and to get them to come in range took some preparation. 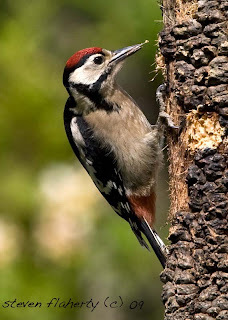 As I new roughly the time of year that the young woodpeckers would fledge, around easter time I spoke to my father in law and asked him could I set up a tree branch in the garden. This log had holes drilled in it to take peanuts and peanut butter. 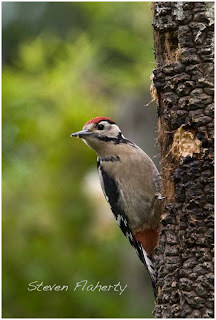 I could not believe how quick that the adult woodpeckers came to feed on it. Within hours they were confident at feeding on it and after a few days we moved it closer to the house. They still came and were not bothered at all. This pre planning is sometimes vital to get the shots that you need and the proof is in the pudding as they say. Below are some of the images that have been taken in the garden. fstops ranged from f4 to f8 and the shutter speed I was aiming for was over 1/500 of a second. I could allow this to go to around 1/200 of a second as long as I used the shutter release and locked the mirror up to eliminate camera shake. Below are the best of the pictures that I took during my time in the hide.